From “Diamonds are a girl’s best friend” to “Diamonds are forever”, diamond sellers have been wooing women and their men since many years. But, times have changed and so have the selling pitches. Today’s women are independent both in their views and in their appetite for life. Individuality and self-expression mean everything to them, and they enjoy a social status of their own. Celebrating the forward-thinking, independent woman of today is Tanishq’s new television commercial for the launch of Zuhur, its latest diamond jewellery collection. Tanishq, one of India’s trusted jewellery brand by the Tata-owned Titan Company, has always been pro women in its ad campaigns. For Zuhur, the jewellery brand has held hands with a group of three friends spending a reunion evening together, in the company of folk music and their cherished friendship. Conceptualized by Lowe Lintas, the minute-long film also features Rajasthani singer Mame Khan Manganiyar and his troupe. The three are seated at a fine dining restaurant when one of them gets up to leave. The other two insist for her to stay, but she is hesitant. Suddenly, one of the friends starts singing ‘Sanu Ek Pal Chain Na Aave’, a popular classic by Nusrat Fateh Ali Khan. Taking a cue from her, the singer Mame Khan Manganiyar and his troupe start singing the song, and the delighted friend decides to stay. The three women are seen having a great time listening to and enjoying the lyrics, while the camera captures their glittering pieces of diamond jewellery. The film ends with, ‘Beautiful diamonds for beautiful occasions’. 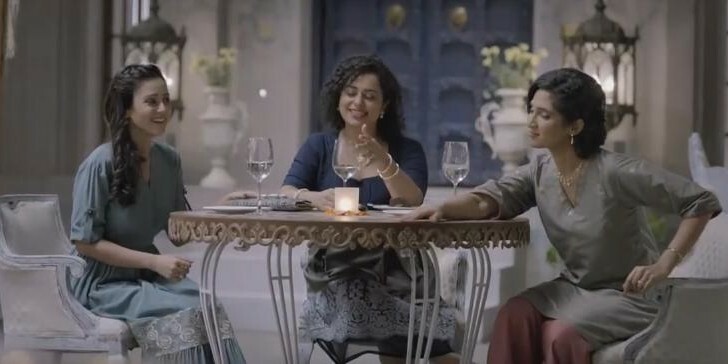 Tanishq has added another memorable ad into its repertoire of women-centric ads. Back in 2013, it created a massive social media buzz by bringing up the subject of second marriage in its ad. Going against society stereotypes by featuring the second marriage of a dusky bride, who is the mother of a little girl, Tanishq stole headlines everywhere. Most Indian and International publications carried it with adjectives like ‘taboo-breaking’, ‘fantastic’,‘outstanding’ and ‘progressive’. It also won a place in Adweek’s list of ‘The 7 most inspiring ad campaigns for women in 2013’. The Tanishq 2014 wedding film featured a broad-minded dadi who is encouraging her granddaughters to fall in love outside their caste. On Mother’s Day this year, the jewellery brand had roped in actress Deepika Padukone for a Mother’s Day celebration film. Deepika is seen thanking her mom by gifting her a neckpiece from Tanishq. Tanishq’s ads are in sync with the nation that is increasingly getting pro-women and driving social media conversations around women empowerment. The ads are not just product promotion tools for the brand but also help shape the brand image one memorable ad at a time.